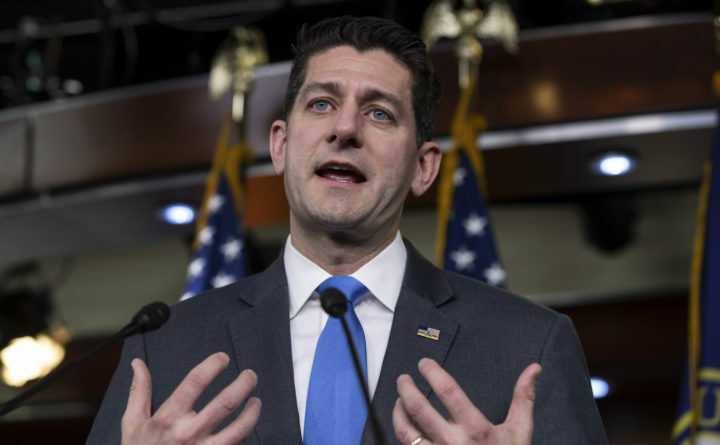 Speaker of the House Paul Ryan, R-Wisconsin, tells reporters he will not run for re-election amid Republican concerns over keeping their majority in the House of Representatives, during a news conference at the Capitol in Washington on Wednesday. WASHINGTON — Republicans are increasingly worried they will lose control of the House in the midterm elections, furiously directing money and resources to hold and potentially boost their narrow majority in the Senate. To many, the Senate is emerging as a critical barrier against Democrats demolishing President Donald Trump’s agenda beginning in 2019. Worse yet, some in the GOP fear, Democrats could use complete control of Congress to co-opt the ideologically malleable president and advance their own priorities. Democratic enthusiasm is surging in suburban districts that House Republicans are struggling to fortify, causing GOP officials, donors and strategists to fret. They have greater confidence in the more rural red states Trump won convincingly that make up the bulk of the Senate battlefield. Senate Majority Leader Mitch McConnell, R-Kentucky, and his allies are seeking to capitalize on concerns about the House. He is leading an effort to motivate conservative voters by reminding them that his side of the Capitol has the unilateral power to confirm federal judges and Trump administration nominees. Trump is showing a keen interest in the Senate landscape, raising money for a highly touted challenger, helping clear the primary field for an endangered senator and playfully engaging in an intraparty contest. And marquee Republican challengers are stepping up to run for the Senate, even as House GOP retirements pile up. The latest blue-chip recruit is Florida Gov. Rick Scott, who is expected to launch his challenge to Democratic Sen. Bill Nelson on Monday. “Our donors will often say we need to do everything we can to hold onto the Senate, because there’s a chance we may not be able to hold the House,” said Steven Law, a former McConnell chief of staff who runs a super PAC called the Senate Leadership Fund. While some Republicans believe they can expand their 51-49 Senate advantage, simply holding the slim majority has grown increasingly more complicated. Hard-right Republicans running in Arizona and Mississippi and a competitive open race in Tennessee could lead to Democratic gains. An even better pickup opportunity exists for Democrats in Nevada. But on the whole, the Democratic path to the Senate majority is more daunting: They are defending 26 seats to just nine for the Republicans. Trump won in 10 of the states where Democrats are playing defense. They include North Dakota, West Virginia, Indiana and Missouri — all states he won by 19 points or more. In the House, Republicans have built their ranks on locking down seats in suburban and exurban districts. But in these areas, Democratic turnout has been high in elections over the past year, fueled by anger with Trump. If Democrats can gain 23 House seats, they will clinch the majority. Rep. Tom Cole, R-Oklahoma, put the chances of holding the House majority at “50-50.” The veteran party strategist warned that “the environment could easily continue to deteriorate,” and said he didn’t begrudge McConnell for pitching his case for the Senate. “If I had to bet right now, I’d say we lose the House,” said Dan Eberhart, a wealthy oil industry executive and major GOP fundraiser raising cash for several Senate contenders. At the same time, Eberhart predicted a Republican gain of three or four seats in the Senate. He said it is “galactically important” to hold the upper chamber of Congress so that Republicans can confirm nominations from the White House. McConnell sounded similar notes Tuesday when he likened the electoral headwinds to a “Category 3, 4 or 5” storm. Republicans need to keep control of the Senate because “even if we were to lose the House and be stymied legislatively, we could still approve appointments, which is a huge part of what we do,” he told a local editorial board. A Republican close to the Senate leader said McConnell was laying the foundation for an argument that could appeal to right-leaning voters: A GOP Senate will confirm conservative judges. The Republican, who spoke on the condition of anonymity to be candid, predicted that more reminders about the Senate confirming Neil M. Gorsuch to the Supreme Court last year will show up in the campaign. And if the speculation that Justice Anthony Kennedy might retire this summer becomes reality, Republicans would use that as a rallying cry for keeping the Senate. Michael Steele, a former Republican National Committee chairman, said the House “may be further gone than people like to admit publicly.” While many in the party worry about a Democratic House and Senate launching an endless string of hearings and investigations into Trump, Steele said he has a different concern — that Democrats will work with the president to pass legislation that Republicans won’t like. After backing embattled Republican Roy Moore in Alabama’s special election last year, only to see him lose, Trump has put greater effort into helping more mainstream Senate contenders. He ended a fierce Republican primary in Nevada by coaxing challenger Danny Tarkanian to abandon his bid against Sen. Dean Heller and run for the House. He raised money for state Attorney General Josh Hawley in Missouri. And he helped recruit Scott to run in Florida and Rep. Kevin Cramer to mount a campaign in North Dakota. On Thursday, Trump visited West Virginia for a roundtable on tax reform. At the end of his event, he conducted an informal audience poll of two Republican candidates for Senate who were seated to his left and right: Rep. Evan Jenkins and state Attorney General Patrick Morrisey. “It was fairly close,” the president remarked, seeming to enjoy the political spectacle. Snubbed was a third GOP candidate, former coal executive Don Blankenship, who served a one-year prison sentence for conspiring to violate mine safety and health standards after an accident killed 29 miners. Republicans fear a Blankenship primary win could cost them a shot at the seat. Vice President Mike Pence has also pitched in to help Senate Republicans. He will hit the road in the coming days to raise money for Heller, who is considered the most vulnerable Republican senator up this year. Pence, who has also been campaigning on behalf of House and gubernatorial candidates, is expected to travel to his home state of Indiana once the GOP nominee is chosen in the May 8 primary, a White House official said. Against Sen. Joe Donnelly, D-Indiana, Pence plans to level the same, “Joe voted no” line of attack he used against Sen. Joe Manchin, D-West Virginia, earlier this year when he hammered Manchin for opposing the sweeping Republican tax law, the official said. But a trio of seats Democrats are trying to flip from Republican control could hinder the GOP effort to save the Senate majority. In each, the White House is confronting difficult decisions. There is growing concern among Republicans about Arizona. There, Rep. Martha McSally is in a three-way primary against former Sheriff Joe Arpaio and former state Sen. Kelli Ward, each of whom is trying to run to McSally’s right. Some Republicans have wondered whether the White House should intervene and hasten a showdown between McSally and Rep. Kyrsten Sinema, the Democratic recruit who is seen by Republicans as a real threat to win in November. In Mississippi, party leaders want to stop hard-right state Sen. Chris McDaniel in a special election. Republican Gov. Phil Bryant appointed Republican state Agriculture and Commerce Commissioner Cindy Hyde-Smith to fill retired Republican Thad Cochran’s seat and run in the special election. Trump and McConnell wanted Bryant to run. Neither has endorsed Hyde-Smith yet. Democrat Mike Espy announced his candidacy last Friday, giving the party a solid candidate for a Southern seat. The Mississippi race has no partisan primaries before the Nov. 6 election. Instead, all the candidates will appear on one ballot, and GOP leaders worry about McDaniel advancing to a runoff against a Democrat. In Tennessee, White House political aides worked to keep Republican Sen. Bob Corker from reversing course and running for reelection. Now, they are hoping that Rep. Marsha Blackburn can outperform public polls showing her losing to former Democratic governor Phil Bredesen. Still, keeping the House is the steeper climb for the GOP. And each day, it gets even tougher. The nonpartisan Cook Political Report moved 13 House races toward the Democrats in its rating system last Friday. The divergent House and the Senate outlooks have caused a kind of cognitive dissonance for Republicans. When they describe the overall mood of the party, some send mixed signals. “It’s like fear, excitement all combined into one,” said Frank VanderSloot, a top conservative donor and the chief executive of an Idaho nutritional-supplement company.